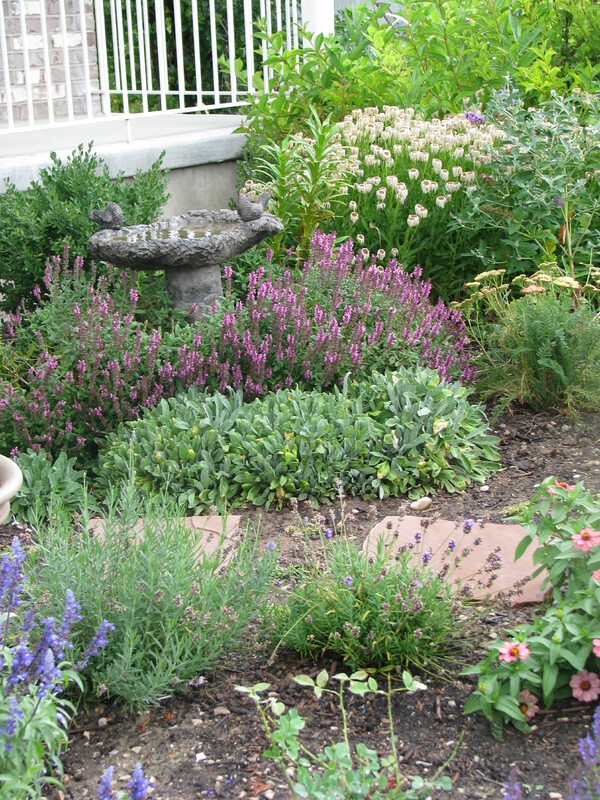 It is once again Garden blogger Blooms day for August. I hadn’t realized that I had not posted since April, missed all the in between months of spring and summer and now everything is on the dry and tired side. I managed to take some pictures right after a rain storm a week or two ago,when things looked a little fresher. 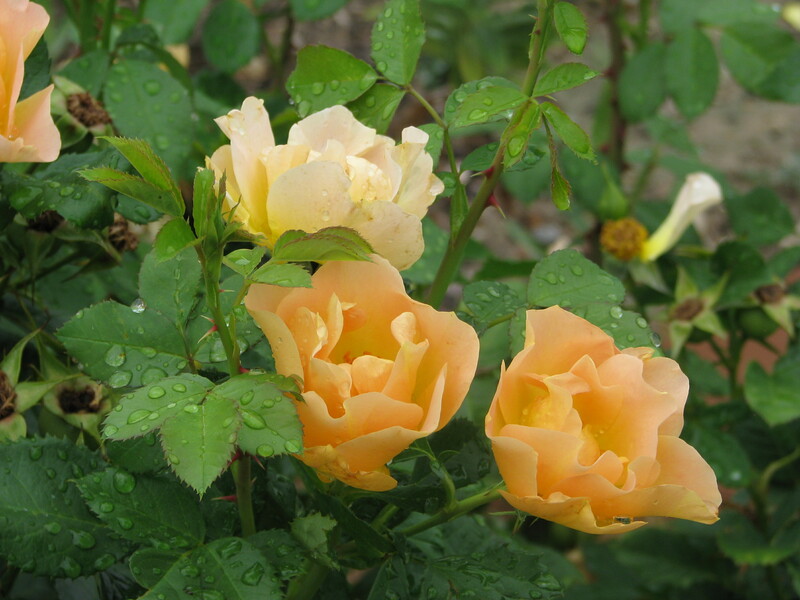 This is a Morden Sunrise rose, it really is beautiful and has a light fruity scent. Even the bees like it. Last year after I planted it in the fall, I noticed that the hips turned an orangey red that would attract my attention from across the yard. So this year it covered in hips and I can’t wait to see it in the autumn. Yeah for no deadheading too! They look like little stars, bet they’d look good in a fall arrangement once they turn color. 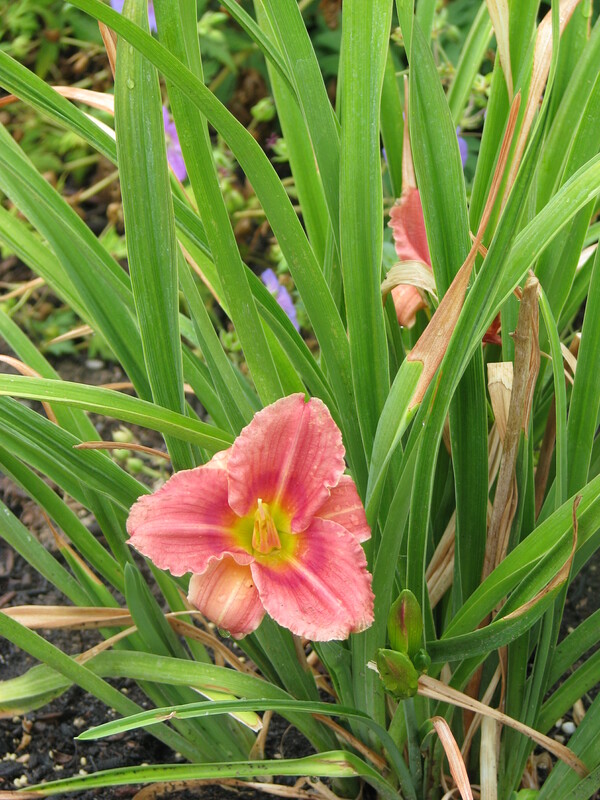 Day lily Mini Pearl Pink? Day lily season has come and almost gone. Last year I plant several varieties. Mini Pearl Pink is definitely my favorite of the 3, only I don’t think that is what it really is…I bought two and planted them together, they are supposed to be pale pink with a light green throat and no discernible eye. What ever this is definitely taller than the 16 inches “Mini” is supposed to get, closer to 24 inches or taller. 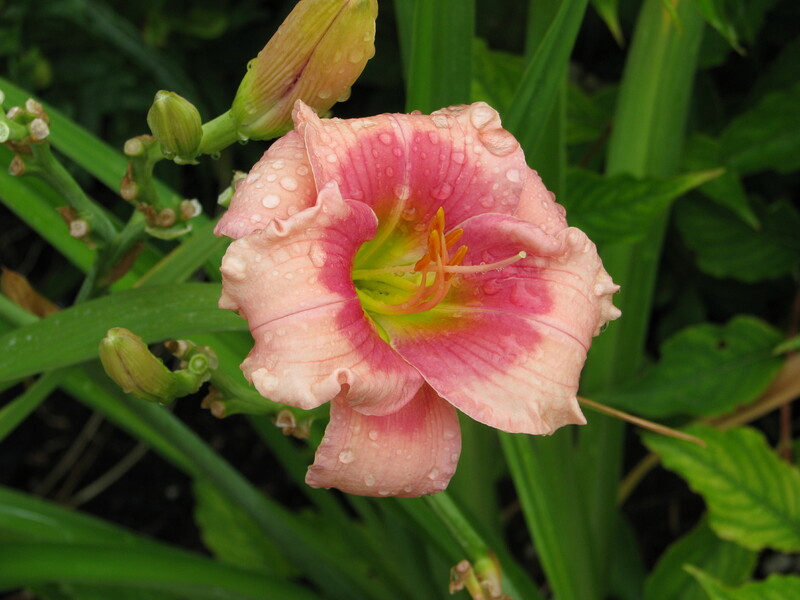 It looks like what is on the tag for Strawberry Candy, of course that day lily looks nothing like any of the tags I have, being a muddy mauve that has chartreuse edges. It was not picture worthy, though I am hoping it will improve as it settles in. Rosy Returns did alright, some flowers were prettier shades than others. I don’t think I would purchase it again though. 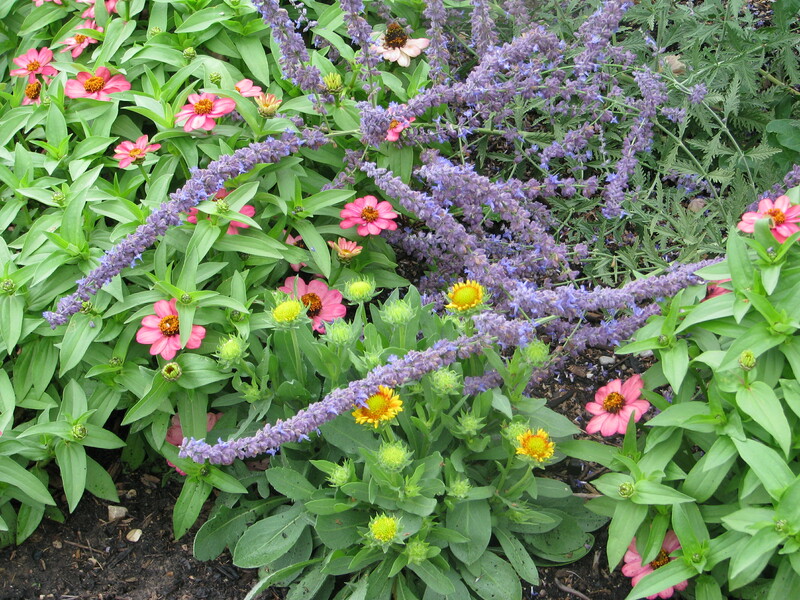 Zinnias, Gaillardia “Arizona Apricot” and Russian Sage bloom in one of the hotter spots in the yard. 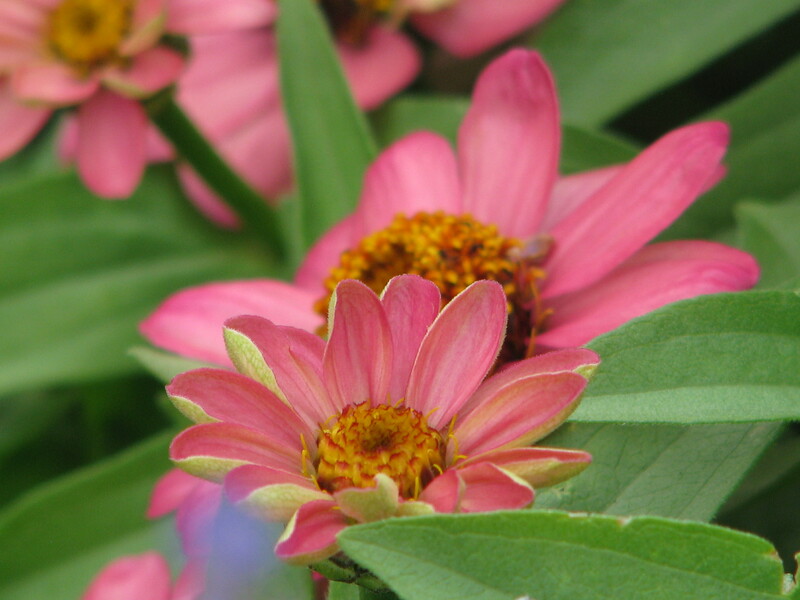 I love perennials, but I love to slip in some zinnias, they do so well in our dry heat. Next summer I am planning on sowing some of the taller varieties and some cosmos for cutting. 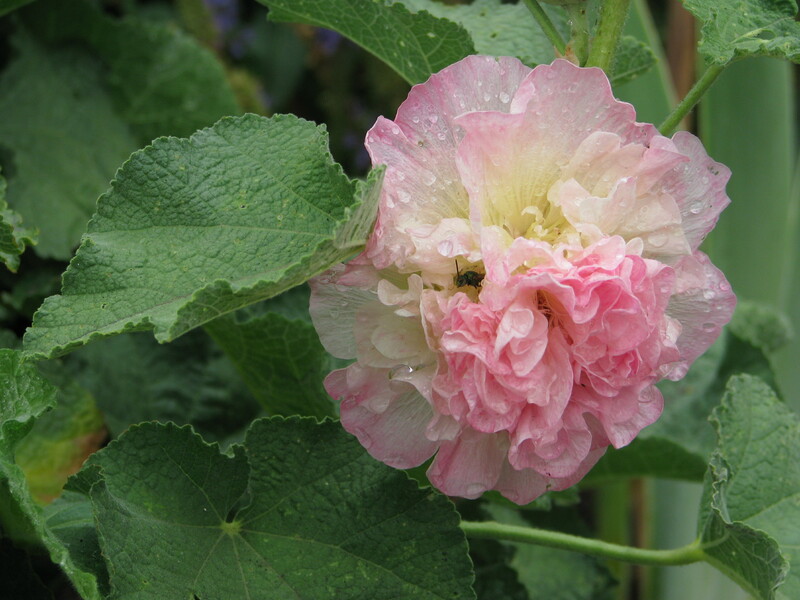 A tiny native bee hiding in the blossom of a hollyhock “Peaches and Dreams”. 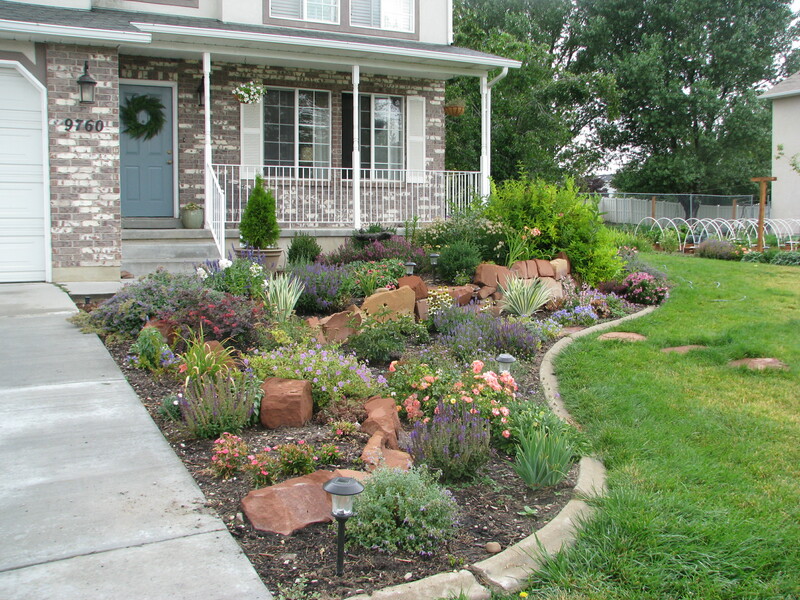 Lastly a few wider shots of our maturing garden. In the foreground is a Boscobel english rose. 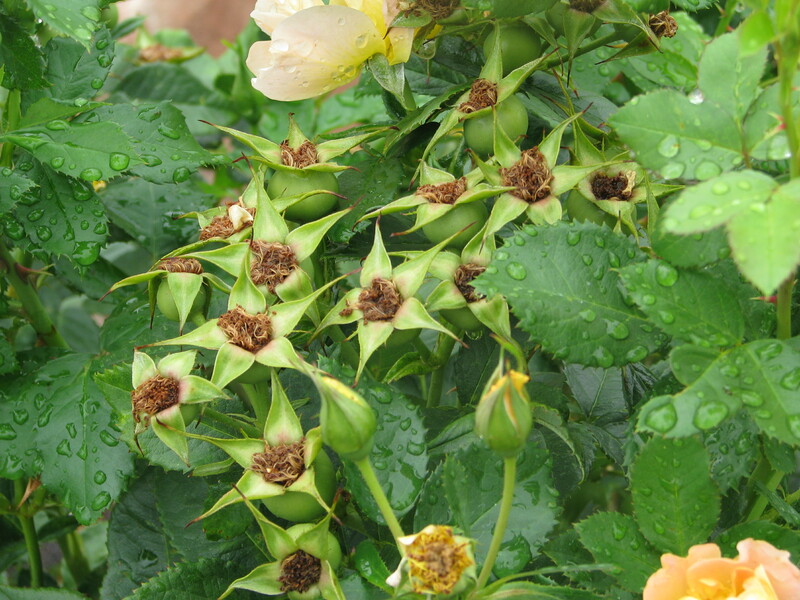 Our crazy hot June stressed both of my newly planted David Austin roses, they both lost most of their newly grown leaves. Thankfully both seem to have recovered and I got one little rose from the Boscobel. Can’t wait to it fills in that area with fluffy pink blooms! Thank you! I’ll head right over! Love your English rose! I stopped trying to grow them because I do not have enough sun. I am jealous of the colored hips for late season! Thanks for stopping by my garden blog. Thank you! I wish sometime that I had a little less sun, haha. Thanks, Vicky. I would love to see pictures of you new yard. Maybe we could brainstorm through email? How to make a T-Rex!